You can’t keep prices the same indefinitely, but raising them is always a gamble. Consumers can — and do — compare prices anywhere, anytime, on everything. If your bottom line needs a boost, raising prices can definitely help — as long as you map out a strategy and avoid some common pitfalls. When you’re ready to roll out the increase, plan to roll out some promotions and coupons at the same time to take the sting out of higher prices. The discounts will help keep your most cost-conscious consumers in the fold. Making discounts and coupons readily available establishes the perception that all your prices are reasonable, which may or may not be true. If you’re concerned about promotions hurting your bottom line, don’t be. Not all of your customers will clip coupons or shop sales. Ideally, you’ll sell enough items at the higher price to raise the average sale. If that’s not happening, you can always give prices another nudge, although it’s better to go with one large increase than several small ones. Another way to improve your financial picture is to cut costs. One common tactic is to keep the price the same but shrink the amount of product (e.g., a skinnier box of cereal or slimmer container of juice). But this can backfire. If customers discover the change and feel cheated, you could become the target of a social media campaign, which could turn out badly. You could end up with less business and a ruined reputation. Thinking outside the box (rather than shrinking it) might provide some opportunities to increase revenue. For instance, you might be able to unbundle a popular product. You can actually lower the price of the basic item, then add additional charges for each bell and whistle. Big box stores and online shopping may help customers find lower prices, but there’s one thing they can’t do. They can’t give their customers the kind of service you can. That’s a value only small businesses can offer. If you do it right, it can help you weather a price increase. Call us today at 616-888-6270 for more tips on how to ensure you’re following business best practices, and let us help you keep your company in the black. Or, visit our business accounting services page to learn more. Who knew you had a green thumb? You started gardening as a way to de-stress. Now, you’re growing exotic orchids in your family room. It was a pricey hobby until you learned how to propagate orchids and started selling them to other hobbyists. And now you’re thinking you might be able to turn growing orchids into an income source — and your hobby into a business. Once people start making money from their hobbies, they frequently start to deduct all of their hobby-related expenses. At this point, the IRS can become very interested in the nature of the taxpayer’s hobby/business. There are certain tax guidelines to keep in mind. If you earn income from your hobby, you generally can deduct bona fide hobby-related expenses up to the amount of the annual income your hobby generates. You must itemize to claim the deduction. Hobby expenses fall into the “miscellaneous” category, so they are grouped with any other miscellaneous expenses you have, and only the amount exceeding 2% of your adjusted gross income is deductible. These restrictions don’t apply to business expenses. If you operate an active business, your business-related expenses generally will be deductible, even if they exceed your business income (limitations apply). The IRS won’t just take your word for it. It has a set of guidelines to determine whether a hobby qualifies as a business. First and foremost, you must be pursuing the activity with the goal of making a profit. If you’ve made a profit in three of the last five years (two of the last seven if your activity is horse breeding, showing, or racing), the IRS assumes you had a profit motive. Do you keep accurate books and separate your venture’s finances from your personal finances? Do you spend significant time and effort carrying out the venture? Does the activity involve a significant element of personal pleasure or recreation? Don’t deal with tax issues on your own. Call us right now to find out how we can provide you with the answers you need. Call us right now at 616-888-6270 to find out how we can provide you with the answers you need. Or, request a free consultation online. Busy is good. Most small business owners would rather things were too hectic than too slow. As the year winds down, though, let your staff handle the busy-ness while you look at the business — where you are, what you’ve accomplished in past year and where you’re headed in the new year and beyond. The quickest way to figure out where you are is to check your bottom line. Are you making money? Are profits better or worse than they were last year at this time? Are you meeting your expectations? If not, why not? Change is inevitable. And businesses have a way of outgrowing their business plans. But if you don’t have a current plan, you don’t have a way of measuring your progress. So if you’ve been “off road” without a plan for a while, it’s time to formalize a plan that reflects past growth and sets new goals for the next several years. The more you know about your competition, the better. Who are they? How are they different? How are they the same? Where do you overlap each other? Understanding their business model will help you prepare strategically for possible changes in the marketplace. Your work force is your secret weapon, especially if you’re in a competitive market. Dedicated, well-trained employees providing top-notch customer service can help put you out front of even the largest competitor. A rich, competitive benefits package will help you attract — and retain — a high-caliber work force. Health insurance and retirement plans are highly valued benefits. You can offer a variety of other benefits to suit your employees’ needs and your budget. Ask your financial professional for information. Do you have a formal succession plan? Are you grooming someone to take over? A well-trained successor could help in the successful — and profitable — transfer of your business. And you can use life insurance to pre-fund all or part of the sale. Don’t get left behind. Contact us today at our Grand Rapids or Grand Haven office to discover how we can help you keep your business on the right track. Nonprofit organizations exempt from tax under Section 501(c)(3) of the federal tax code — schools, religious groups, hospitals, social service providers, and other public charities — should be careful not to violate the law’s prohibition on political campaign activities. Participation or intervention in a political campaign on behalf of, or in opposition to, a candidate for public office is absolutely prohibited, whether it’s done directly or indirectly. This restriction applies across the board to campaigns of candidates running for national, state, or local public office. An organization may educate voters as long as it’s done in a nonpartisan, unbiased way. For example, organizations may prepare and distribute voter education guides or hold public forums. But all candidates seeking the same office should have an equal opportunity to be represented or participate. Neutrality — in content, wording, questioning, issues for discussion, etc. — is key. Board members and other leaders of an organization may, of course, hold their own political views. But when they express those views, they should make it abundantly clear they are speaking for themselves, not on behalf of the organization. Leaders should avoid making political statements at organization meetings. Similarly, the organization’s resources or publications should not be used to express political views. A charity may conduct educational activities regarding public policy issues of importance to its mission, including issues that divide candidates in an election for public office. However, messages that could be construed as political campaign intervention should be avoided. Violating the prohibition on political campaign activities can result in revocation of an organization’s tax-exempt status and the imposition of certain excise taxes. Visit our website to learn more about non-profit compliance issues and non profit accounting. Or, give us a call today at 616-888-6270. We look forward to helping your non-profit grow. 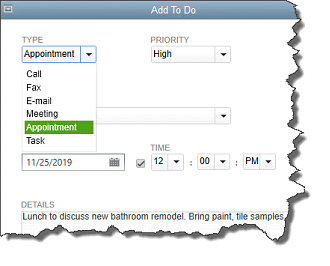 What QuickBooks’ Calendar Can Do for You? Show. What items would you like to have displayed on the calendar? It defaults to All Transactions, but you can filter it by transaction type. Call Grand Rapids CPA Chris Brown at 616-888-6270 today to find out how we can work together for your success or request a complimentary consultation online now. 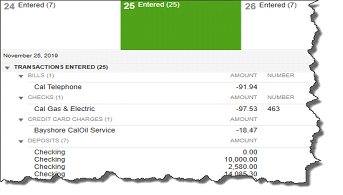 You can also learn more about our QuickBooks accounting services on our website.